Since generation of waste cannot be completely eliminated due to limitations in processes or technology, all ITC Businesses/Units are mandated to ensure recycling of entire (100%) waste generated. This not only conserves precious natural resources and energy but also prevents waste from reaching landfills, with all its attendant problems like health hazards, increase in GHG emissions, soil and ground water contamination, etc. In addition, Recycling also creates significant employment opportunities for the marginalised sections of society. 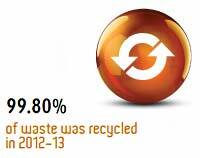 We have ensured recycling of 99.8% of the total waste generated in all the ITC Business Units. It is noteworthy that ITC’s Unit at Bhadrachalam, which is India’s largest integrated Paper & Paperboards mill, recycled 99.9% of its waste in 2012-13. In 2012-13, ITC generated 2,87,950 tonnes of fly ash, (42% of total waste in ITC), 100% of which has been utilised for brick making and cement manufacturing. In line with our commitment to consolidate our waste recycling positive status, many of our Units, have already achieved total recycling of waste generated out of their operations. Cigarette factories at Munger, Bengaluru, Saharanpur, Kolkata and Pune, Paperboards & Specialty Papers Units at Bhadrachalam and Tribeni, Personal Care Business Units at Haridwar, Foods Business Units at Haridwar (Snacks) and Pune, Packaging & Printing Business Unit at Tiruvottiyur, Leaf Threshing Business Unit at Anaparti, Research Centre at Rajamundry, ITC Green Centre at Gurgaon, Surya Nepal’s Cigarette factory at Simra, and ITC Hotels - ITC Maurya, ITC Maratha, ITC Grand Central, ITC Windsor, ITC Mughal, ITC Gardenia, ITC Kakatiya, ITC Sonar, My Fortune Chennai, ITC Rajputana and Sheraton New Delhi. As depicted above, the high degree of recycling achieved across ITC’s Units together with the use of post consumer waste by the Paperboards and Specialty Papers Units at Kovai and Bhadrachalam create yet another positive environmental footprint. ITC’s WOW initiative not only creates awareness among the people about the advantages of the “Reduce- Reuse-Recycle” process to protect the environment, and improve civic amenities, public health and hygiene but also generates cost-effective raw materials for the paper, plastics, metal and glass industries. What started in a small way in households has now spread to schools, government offices, Corporates and other institutions. The WOW initiative which commenced in 2007 with an average monthly collection of 100 tonnes, has spread across South India and 26,731 tonnes of waste was collected through this initiative in 2012-13.